It was only last week that we reported on Apple allowing the first live-streaming program onto its App Store, Live Knocking Video. 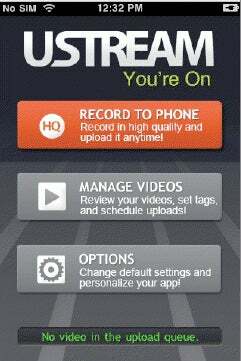 Now the floodgates have opened, with Ustream's app available not just for jailbroken iPhones any more. Ustream has had an official iPhone app available for a while now, but due to Apple's strict policies users could only upload video online after filming was finished—ie, not live at all. Enabling live streaming video from your iPhone to the internet, it works over a 3G connection and can update Twitter/Facebook etc of your live-streaming status. You've probably seen updates from friends before, using Ustream or Qik on other devices (or jailbroken iPhones), but this week's app launch is big news for anyone who's been following the live-streaming video debacle.